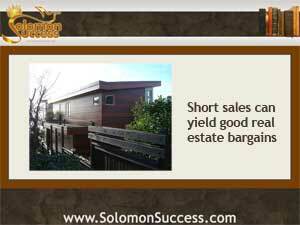 Solomon Success > Blog > Short Sales: Bad Name for Good Real Estate? King Solomon’s advice for successful and prosperous living arises out of the core virtues of wisdom and prudence. And that’s a combination that produces discernment – the ability to see things clearly and recognize truths. Discernment can come in handy in today’s real estate market, too, as homebuyers willing to look past the “short sale” label are finding good properties at deep discounts. The number of short sales soared nationwide in the aftermath of the housing collapse of 2008, only to drop again as the housing market began tot get back on its feet and homeowner bailouts helped struggling borrowers with their debt. But home prices are on the rise and some refinancing options=s are drying up, so some short sale homes are still hitting the market. A short sale is just that – a home is sold for an amount short of the mortgage owed. It can be an attractive alternative to foreclosure, since although he seller won’t make any money on the deal, the difference between the total mortgage owed and the actual sale amount may be forgiven or written off by the lender. But a new report by MarketWatch points out that the words “short sale” in a listing raise red flags with buyers. Foreclosures appeal to investors because they’re cheap and usually easy to buy. The short sale process is typically longer, though, since the seller must get permission from the lender to put the home up for sale. Short sales also attract scammers who promise to broker deals or do an end run around the lender’s claim on the proceeds. But short sale properties are generally in better shape than a foreclosure. And since short sale homes remain listed for longer than either foreclosures or standard sales, prices are often steeply discounted and keep dropping the longer the home is listed. The short sale market is shrinking, though. While foreclosures continue to hit the market with some regularity as old and pending cases work through the system, housing experts say that the overall health of the housing market means fewer homeowners are needing to resort to this option. “Short Sale Stigma Helps Home Buyers.” MarketWatch. MarketWatch.com 24 Jul 2013. What Would Solomon Say About Digital Money?